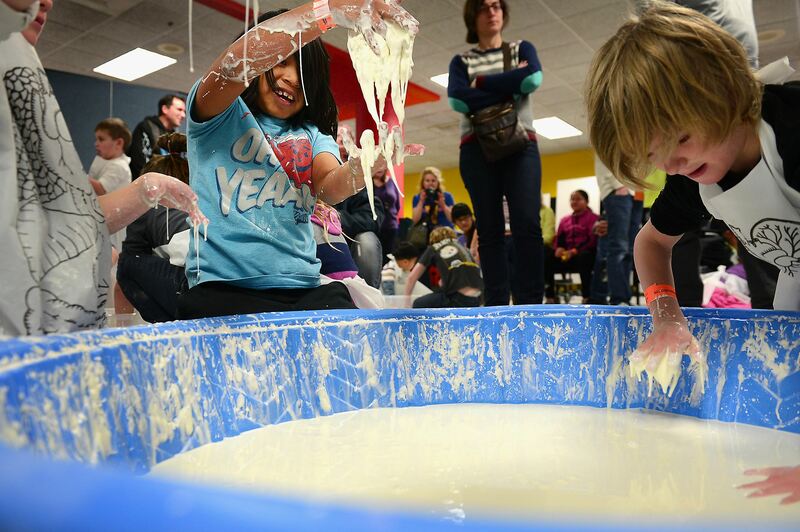 The highlight of Carnegie Science Center’s annual MessFest for 8-year-old Perry Riggle was his reigning title as “Chief Geometrist” after winning the pudding “pi”-eating contest in his age division for the second year in a row Thursday. 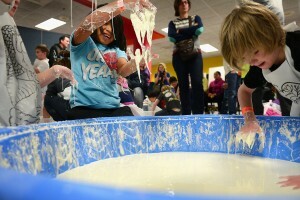 The MessFest, held on the first day of the year at the North Shore science center, had all-day activities ranging from finger-painting to kids making their own sidewalk chalk. The two most popular attractions are usually tubs filled with ooblek, a gooey substance made of corn starch and water, and the egg drop, where kids can build a case for raw eggs that will protect their “egg-stronauts” from the pavement, spokeswoman Susan Zimecki said. 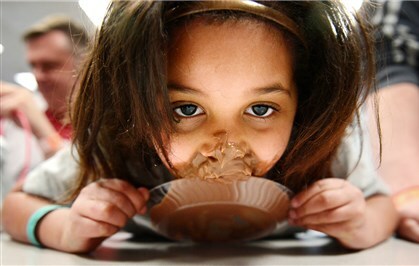 For the pudding “pi”-eating contest, contestants are broken up into three age groups — children 7 and under, kids 8-12, and teenagers and adults. Mounds of pudding are piled onto a small saucer, and contestants race to see who can finish it first using only their mouths to eat. The New Year’s Day crowd was its largest to date in the eight years the center has sponsored the activities — more than 3,500 people showed up to the sloppy fun day for kids, Ms. Zimecki said. A long line of visitors had already formed when the center doors opened at 10 a.m.
Monroeville resident Lynn Greenway arrived at the center as the doors opened at 10 a.m., and said there was a line of more than 50 people in front of her waiting to buy tickets. Her two daughters Anna, 2, and Kathryn, 4, went straight to the oobleck pools when they got inside, she said. 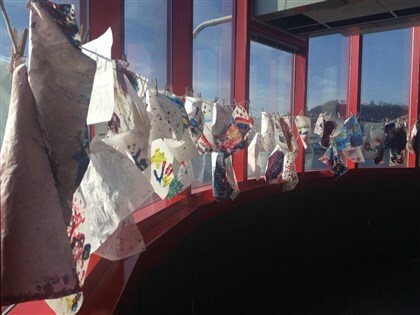 Participating in the MessFest has become a tradition for some families. Kelly Riggle, Perry’s mother, has attended MessFest with her family for the past five years, and participated in the race with her son for the second year in a row. Last year, her family recorded a video of her winning in the adult pudding “pi”-eating contest and uploaded it to YouTube. The number of games and activities and the amount of people participating have significantly grown over the years, she said.